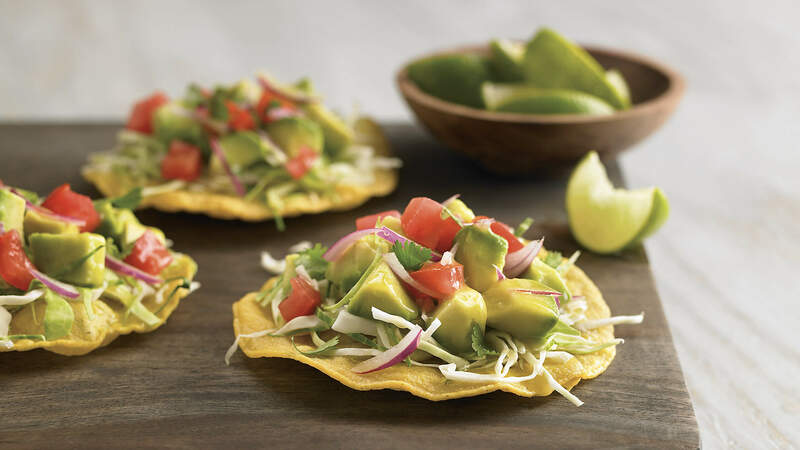 Avocado is the star of the show in this tasty vegetarian recipe for spicy Guacamole Tostadas, sure to become an appetizer menu favorite. Guacamole has reached ubiquity on appetizer menus and consumers are constantly searching for new flavors and preparation methods. TABASCO® brand Original Red Sauce --- 2 tsp. Corn tortillas,6-in. diameter --- 3 ea. Heat vegetable oil in a pot; fry tortillas until crispy. Allow to drain. Mix guacamole and TABASCO® Green Sauce; spread evenly on the three tortillas. Mix pico de gallo with shredded lettuce; evenly pile on top of each guacamole-covered tortilla. Mix TABASCO® Original Red Sauce and sour cream; drizzle over the tops of the tortillas.